Alaimo, Katherine., Packnett, Elizabeth., Miles, Richard A., Kruger, Daniel J. (2008). Fruit and vegetable in-take among urban community gardeners. Journal of Education and Behavior 40:2, 94-101. Bremer, A., Jenkins, K. & Kanter, D. (2003). 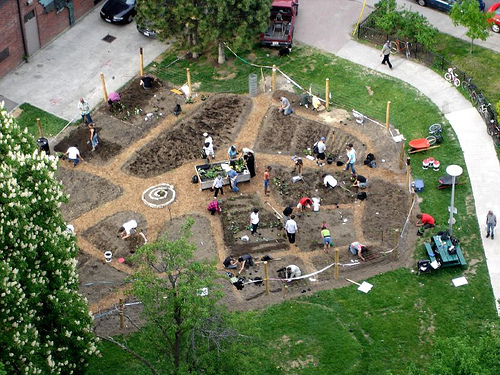 Community Gardens in Milwaukee: Procedures for their long-term stability & their import to the city.– Milwaukee: University of Wisconsin, Department of Urban Planning. Cambell, D., Feenstra, G., & Sharyl, M. (1999). Entrepreneurial community gardens: Growing food, skills, jobs and communities. Oakland: University of California, Division of Agriculture and Natural Resources. Caspersen, C.J., Bloemberg, B.P., Saris, W.H., Merritt, R.K., Kromhout, D., 1991. The prevalence of selected physical activities and their relation with coronary heart disease risk factors in elderly men: the Zutphen Study. (1985). American Journal of Epidemiology, 133, 1078-1092. Chicago Botanic Garden and the City of Chicago. (2003). Green connections: A research assessment of com-munity gardening in Chicago. Chicago: City of Chicago. Hlubik, W.T., Hamm, M.W., Winokur, M.A., Baron, M.V., (1994). Incorporating research with community gar-dens: the New Brunswick Community Gardening and Nutrition Program. In: Armstrong, Donna. A survey of community gardens in upstate New York: Implications for health promotion and community development. Health & Place 6 (2000) 319-327. Krasny, Marianne E. Saldivar-Tanaka, Laura. (2004). Culturing community development, neighborhood open space, and civic agriculture: The case of Latino community gardens in New York City. Agriculture and Human Values 21, 399-412. Kuo, F., Sullivan, W., Coley, L, & Brunson, L. (1998). Fertile ground for community: Inner-city neighborhood common spaces. American Journal of Community Psychology, 26(6), 823-851. Kuo, F. & Sullivan, W. (2001a).Aggression and violence in the inner city: Impacts of environment via mental fatigue. Environment & Behavior, 33(4), 543-571. Kuo, F. & Sullivan, W. (2001b). Environment and crime in the inner city: Does vegetation reduce crime? Envi-ronment and Behavior, 33(3), 343-367. Maller, Cecily., Townsend, Mardie., Pryor, Anita., Brown, Peter., St. Leger, Lawrence. (2005). Healthy nature healthy people: ‘contact with nature’as an upstream health promotion intervention for populations. Health Pro-motion International. 21(1). In: Burls, Ambra. (2007). “People and green spaces: promoting public health and mental well-being through ecotherapy.” Journal of Public Mental Health 6(3). Retrieved July 12, 2011 from CINAHL Plus. Tranel, M. and Handlin, L. (2004). Planting Seeds; Growing Communities. St. Louis: University of Missouri Public Policy Research Center.